Vernon, Texas (January 1, 2019)--Cotton producers may need to dial in their planting populations to reduce input costs, according to a Texas A&M AgriLife Research study. Seed costs have become very high for modern cotton varieties due to technology fees, making producers think twice about their seeding rates, said Dr. Curtis Adams, AgriLife Research crop physiologist in Vernon. The issue prompted Adams and colleague Dr. Emi Kimura, AgriLife Extension agronomist in Vernon, to look closer at the plant population needed to optimize yield. "We started by conducting an applied trial in the field but ended up also looking deeply into the scientific literature on this topic and analyzing the data we found there," Adams said. Studies on the effects of population density in cotton have been carried out around the world in many environments, he said, but no work had been done to compare the results and to look for trends. "When we compiled all the plant population data together in the same units, including our own data, we saw that yield declined only at the lowest tested rates and that peak yields were flat beyond that," he said. "Lint yield didn't decline even at extremely high populations." Genetics and water availability made an impact on the yields obtained in each study, but the yield trends with plant populations were remarkably similar across studies, he said. Adams said the results of their field trial aligned with the other studies, many of which came from higher-yielding rain-fed or irrigated studies. "Our dryland and deficit-irrigated results showed lint yield was not affected by plant population, similar to higher-yielding environments over the same range in plant population," he said. Analysis of the data showed that the minimum plant population for optimizing yield with evenly spaced plants is surprisingly low, Adams said. �We identified a plant population threshold of about 15,000 plants per acre, which is a final density of about 1.1 plants per foot on 40-inch rows,� he said. �The research also showed yield will decline quickly below 15,000 plants per acre. He said the most common seeding rate recommendation they found for cotton around the country was 33,000 plants per acre, which is 2.5 plants per foot on 40-inch rows. However, Texas producers often plant at densities of 50,000 plants per acre or greater, Adams said. High seeding rates are often used because certain soil types and planting conditions encountered can be especially challenging when trying to establish a good stand. 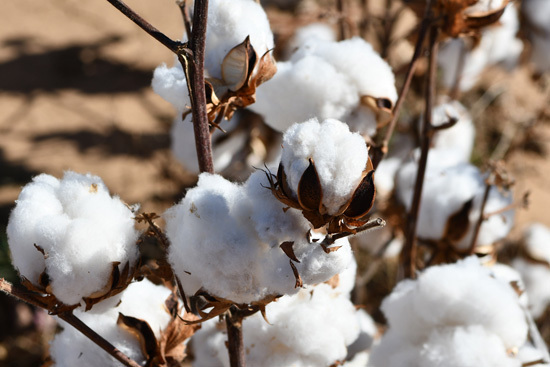 �The 2018 cotton season was a great example of challenging conditions that resulted in spotty stands in many areas of the state, even with high seeding rates,� he said. Even with this in mind, Adams said their analysis suggests that producers may be using excessive seeding rates in many cases, resulting in unnecessary expenses. �In light of our research results, if a producer wants to reduce their seeding rate to lower their production costs, they should consider the soil and environmental conditions they are dealing with on a case-by-case basis,� he said, adding producers should rely on past experience with seed and plant loss. �If a producer typically loses about 20 percent of his seeds in a given situation, and now knows yield is expected to be stable at a lower population, this will help him dial his rate in better and still maintain his production and reduce his overall costs by buying less seed,� he said. The analysis will also be helpful to producers who are facing replanting decisions, Adams said, because they can compare their resulting stand to the threshold. The research is published in Field Crops Research under the title, �Determination of a plant population density threshold for optimizing cotton lint yield: a synthesis.� The article can be accessed at this link: https://www.sciencedirect.com/science/article/pii/S0378429018314035.